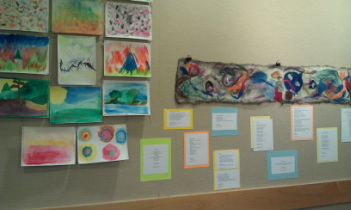 Exhibit of art work and poetry by Greensboro's older adults. In the Journal of Poetry Therapy, S. Silvermarie (1988), states in his study that he found that oral poetry composition by frail elderly residents in a nursing home helped increase friendship formation and reduced institutional loneliness and isolation. Joshua Smyth, State University of NY at Stony Brook, Journal of the American Medical Association, presents evidence that writing that has emotional content decreases symptoms associated with asthma and rheumatoid arthritis. James Pennebaker, researcher, University of Texas at Austin, shows in his study, “Writing to Heal: A Guided Journal for Recovering from Trauma and Emotional Upheaval,” that writing with deep feeling improves immune system function, decreases stress, lowers blood pressure, and increases positive short and long term mood changes.